Stars: Levi Miller, Bryan Brown, Hanna Mangan-Lawrence, Jason Isaacs, Thomas Cocquerel, Calen Tassone, John Jarratt, Kee Chan, Jessica Clarke, Zen McGrath. 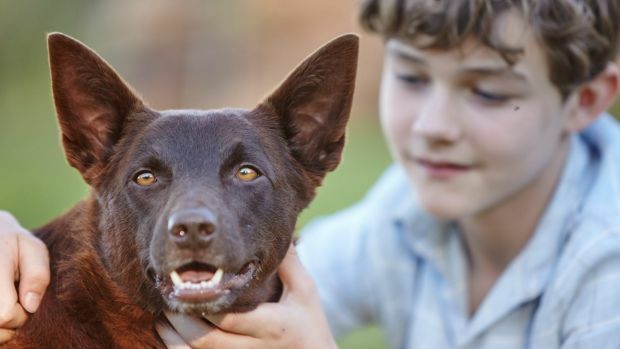 Kriv Stenders’ Red Dog was a feel good film that captivated Australian audiences way back in 2011. It was a genuine crowd pleaser and a tear jerker and also one of the highest grossing films of the year. It proved so popular that are sequel was probably inevitable given how the industry works. But is has taken five years to bring a sequel to the screen. Stenders went off to work on other projects, including the hard hitting television miniseries The Principal with Alex Dimitriades. Now we get this sequel that works as a prequel that tells the origins of the dog that captured the imagination of not only the remote mining district of Western Australia but also the broader film going public. The film has again been written by Daniel Taplitz, but this time he is not using Louis de Bernieres’ book as source material. Rather he takes a fresh approach that doesn’t merely repeat what we saw in the original film, a fault of too many lazy sequels. Taplitz pushes the material in a new direction and gives it its own identity. At heart this is the story of a friendship between a boy and his dog, a familiar trope for many films including tear jerker classics like Lassie Come Home and Greyfriars Bobby. When the film opens, Michael Carter (Jason Isaacs), an emotionally distant and workaholic father is left to babysit his two sons while his wife (Jessica Clarke) is out. The boys have been pestering her for a while about getting a dog for companionship. Michael is ambivalent about this. Reluctantly he takes the two boys out to watch a movie – that film is the original Red Dog, and it has quite an effect on Michael. Later that night Michael tells his younger son Theo (Zen McGrath) a story about he was the person who originally found the red dog at the centre of the story. Through a series of extended flashback sequences we follow the younger Michael (played by Levi Miller, last seen in the awful Pan) as he is sent away from his suburban home to live with his grandfather (Bryan Brown) on his cattle station in the middle of Western Australia. It is a rather harsh environment for the young Michael. Among the other workers on the station are an eccentric bunch, including the cocky helicopter pilot Bill Stemple (Thomas Cocquerel, from Kidnapping Mr Heineken, etc) who flew missions in Vietnam, the aboriginal stockman Taylor Pete (Calen Tassone in his film debut), and the umbrella toting Chinese cook Jimmy Umbrella (Kee Chan, from Star Wars Episode II: Revenge Of The Sith, etc). Michael feels a little lonely until he finds a puppy stuck in a refrigerator stranded up a tree after a vicious cyclone tore through the region. Because the dog is covered in blue mud, Michael names him Blue. The two become inseparable and share a number of adventures. But somewhat surprisingly, the dog is not at the heart of this story which is more of a coming of age tale for its central protagonist. And there lies the film’s biggest problem – it lacks the charm of the original which had a colourful cast of characters and tapped into something unique about the Australian identity. Red Dog had broad appeal, whereas Red Dog True Blue seems aimed at a younger audience with its younger protagonist and his travails. But this film is also less overtly manipulative and sentimental than the original. Taplitz’s busy narrative manages to work in aboriginal mysticism, land rights, a raging bushfire, the changing face of Australia in the late 1960s, and even the stirrings of first crush as Michael is attracted to his beautiful young tutor Betty (Hanna Mangan-Lawrence, from the dark thriller Acolytes and tv series Bed Of Roses, etc) who is flown in to help him with his education. These incongruous plot elements all make for a very busy 88 minutes. Red Dog True Blue looks superb thanks to the wide screen cinematography of Geoffrey Hall, who also shot the first film, and he captures some great vistas of the Western Australian landscape and some beautiful sunsets. Composer Cezary Skubiszewski, also returning, has created an evocative score that adds to the emotional undercurrent of the film. There is also a great soundtrack of classic Aussie hits that accompanies the action and will strike a nostalgic chord with many. Young Miller is great in the pivotal role and he has plenty of charm and great screen presence and delivers a performance that suggests he could have a bright future ahead. Brown, who was criminally wasted in the recent The Light Between Oceans, has his best role for some time and he rises to the occasion with a great performance as the no-nonsense grandfather who is gruff on the outside but warm hearted on the inside. The titular blue dog is played by a kelpie named Phoenix, and it seems to hit all of its marks and interacts with the human cast effortlessly. Younger audiences will respond positively to the dog and its antics. Stenders has assembled a strong ensemble supporting cast who deliver solid performances. There is also a wonderful cameo from Wolf Creeks‘ John Jarratt as mining magnate Lang Hancock who talks enthusiastically about the potential riches to be found in the Pilbara region. And there is a great scene in which he and Brown play banjoes together. Isaacs on the other hand is given little to do as the older Michael. And the framing device with the older Michael relating the story to his son seems a little clunky, unnecessarily contrived and unconvincing. Whether Red Dog True Blue will be able to replicate the success of the original remains to be seen, but this family friendly film should do well over the holiday season.